It is a privilege to be included in this series of blogs and to talk about being a GP in the context of Maternity Care. 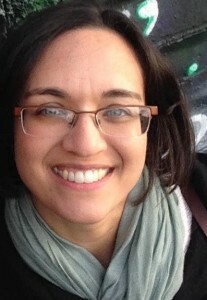 My name is Louise Santhanam and I am a General Practitioner and mum to 3 children under 7 years old. Unlike some of the other voices in this series, I am currently taking a short career break (more on that later). I have recently become involved with the #MatExp community, and it is extremely uplifting as a clinician who cares about the whole person and the family to see so much positive work going on, at a time when the NHS is facing uncertainty and extreme challenge. Probably the biggest difference between the role of the GP and the other professionals who have already told their story here is that Maternity care is one strand of what we do. A GP will often look after a Mother or a couple prior to conception, then on through their pregnancy into the postnatal period, and beyond. The GP will be responsible for the care of baby, siblings and often Dad too, so we have a unique perspective and a responsibility to promote and protect the health of the whole family unit. Rather than meaning we just ‘didn’t specialise in anything’, being a General Practitioner means that we have to know a fair amount about lots of things- both medical and social. After congratulating a mother on her new pregnancy, we might be supporting someone with serious mental health problems, diagnosing a possible heart attack or helping adjust a patient’s blood pressure medications- and each case is expected to be managed in around 10 minutes! We have to be quick to use our common sense and apply our training to help when unusual circumstances arise. We might be dealing with common and chronic conditions one minute and then have to respond with urgency to an emergency the next minute. GPs have specialist training in the ‘art’ of the consultation: good listening, communication skills, negotiation and viewing a whole person rather than just an organ or a medical problem. It is our responsibility to be aware when we have reached the limits of our own expertise and when Specialist input is needed. We have to be good team-mates to our Practice colleagues and work with many people who we will never meet, over the phone, by email and by letter. A GP might work ‘single handed’ (increasingly less common) or together with Partners to run their own Surgery either with a dedicated list of patients that they know well, or in a Group Practice where patients can see any of the doctors they choose. 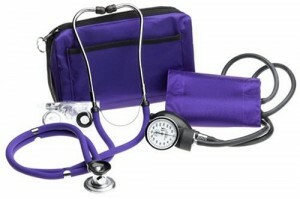 Alternatively, they can work as employees (Salaried doctors) or do sessional work (Locums doctors). Some GPs develop a special interest and increase their knowledge and skills in a particular area of medicine- for example Dermatology, Women’s Health, GP Training or Clinical Commissioning. My personal journey to becoming a GP started with five years of medical school with an extra year of Physiology research, followed by four and a half years rotating through different speciality jobs in hospital, and then one year as a GP Registrar seeing patients in a GP Surgery. I am lucky to have been able to work in Paediatrics, Obstetrics and Gynaecology, Mental Health and Sexual Health, all of which have been invaluable to providing maternity care to patients later as a GP. 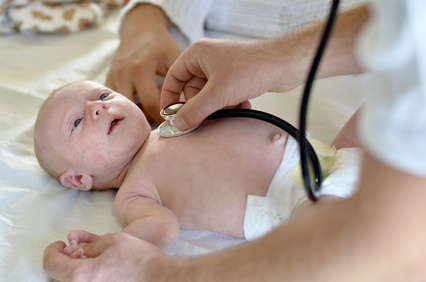 As a GP an average week might include the following and more- starting investigations for a woman who has been having difficulty conceiving, counselling a woman who has suffered a miscarriage, referring a newly pregnant woman to the Midwives for antenatal care, managing a woman with early pregnancy nausea and vomiting, urgently referring a woman with pregnancy bleeding at 32 weeks to the hospital Obstetric team, giving emotional support to a Mum of 3 who is fatigued in the days before her next labour, diagnosing a breastfeeding Mum suffering from mastitis, seeing a new baby for the 6-8 week check and reviewing a Mum’s caesarean scar during her postnatal check. And the next week it will be different again! All of these interactions with a woman and her baby through the maternity journey are extremely important and our responsibility as GPs is to treat a woman and her family with dignity at this significant time in their lives. Care of the Mother’s mental wellbeing and consideration of any other children and their needs is essential. The skill of the GP is to identify what is important, what needs to be dealt with today, what needs to be followed up and what does not need to be worried about. In the community we might signpost women to our Practice Nurse, the Midwives, our Health Visitor colleagues, their local Breastfeeding Support Group, a postnatal Physiotherapist or to not-for-profit organisations which can offer support with mental health problems, practical help at home and financial difficulties. When problems are identified, seeing the same GP can really make a difference to the outcome, as the doctor already knows the story, can quickly assess if things are getting better or worse and has already built a relationship with the Mother. Most GPs want to be able to support a woman to have confidence in her ability to birth and to become a Mother, continuing that support into the postnatal period …often to the next pregnancy and beyond. As a GP work can be extremely stressful with long surgeries, large amounts of additional admin work and other non-clinical commitments like meetings and teaching juniors. Seeing patients at 10 minute intervals you can often feel like your brain is doing acrobatics moving from one scenario to the next. At the end of the day you can feel exhausted. GPs can feel the pressure of the responsibility they carry being the ‘gate-keepers’ to all the health service can offer, or as the sole person who has to decide whether the problem presented is serious or not. It can be heart-breaking to deal with women who have lost their pregnancy, to see the patient you have cared for over months struggle with postnatal depression or to see a new baby become seriously unwell. GPs are human beings too and many of us are also parents. Our branch of medicine takes gives us the privilege to walk along side our patients through the ups and downs in life and at times that can be overwhelming. My personal belief is that our Primary Care service in the UK is a ‘national treasure’ and is something that we should not take for granted. Everything a GP provides is covered by just £136 pounds per year per patient on their list (1). This does not excuse the occasions when care can and should be better, but just gives you an idea of the pressures on General Practice at the moment. I have a personal interest in women’s and children’s health as I believe investment of time, money and effort in looking after a pregnant mother and a new family is the foundation for a healthy society. I am currently taking a career break, in order to look after my own family and restructure my working life. While I have been out of the Surgery I have been working for the Royal College of General Practitioners to raise the profile of Perinatal Mental Health issues and provide GPs with good educational resources to improve their care of mothers who are suffering mental health difficulties. It is really important that women and GPs appreciate that perinatal mental health problems are common. Between 10-20% of women will experience mental health difficulties during pregnancy or in the year after birth, and suicide is one of the major causes of maternal death (2). Once diagnosed perinatal mental health problems can be effectively treated so engaging in discussion about mood and feelings in the perinatal period can potentially be life-saving. I am also passionate about supporting mothers to breastfeed, something that is undervalued in the UK at present and reflected by low levels of prolonged breastfeeding in society. I see the provision of accurate advice to families on infant feeding and good Breastfeeding Support services as a duty for General Practice and the Community, not least because of the health benefits of Breastfeeding, but also because the early infant feeding journey can be emotional and challenging. 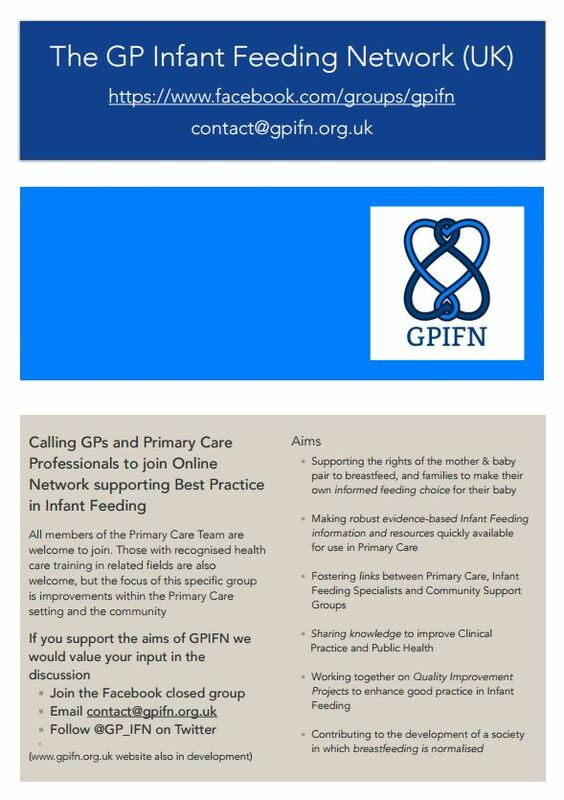 With encouragement from members of #MatExp I recently set up an online Health Professional Facebook group called the GP Infant Feeding Network (UK). Through the positive power of social media myself and members are sharing good quality resources and educational materials on the issue of Infant Feeding and forging links with trained individuals in the field (Midwives, Health Visitors, International Board Certified Lactation Consultants (IBCLCs), Breastfeeding Peer Supporters and others). I personally believe it is so important that women are given reliable information about why breastfeeding is a healthy choice for themselves and baby and that if they want to choose to breastfeed, that they should be well supported to achieve their goals. Support from their GP can be very significant. I was amazed to rapidly make contact with many colleagues nation-wide who share my interest in this issue and have also made local connections, with the aim of increasing awareness of breastfeeding issues within my local GP community. Ultimately, GPs can have a role in all sorts of areas in maternity care and with public health initiatives, we don’t just work consulting at our desks! Despite all the recent negative media stories, financial difficulties for the health service and workload pressures in Primary Care, it is exciting to think that collaboration with colleagues can improve patient care and the experience of working in healthcare. Reassuringly, a recent survey demonstrated that patient satisfaction with their GP was 86% on average (3). When work in the GP Surgery was tough it was usually guaranteed that a consultation with an expectant Mum, or a 6-8 week baby check appointment could cheer me up and remind me that good things do happen in the world! One of the tasks that I always looked forward to was visiting a new baby at home following a homebirth. Entering the home on Day 1 of life to conduct the new-born examination in this situation is almost always an experience of tangible, joyful calm. Life is going on and the family is growing, and I was there to witness it happening. As GPs we need to be able to enjoy our work and look after ourselves so that we can continue to truly care for our community, from the maternity journey onwards.